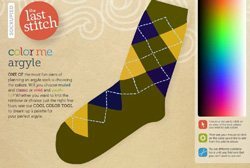 Sockupied: An interactive class in knitting socks! When I was first knitting, I took a lot of classes. I searched yarn shop class offerings for techniques I wanted to learn and I signed up for several classes each session. As I got more experienced, however, I found that I learned better from books and magazines. I like to take my time with new techniques and try them out on actual patterns instead of the swatches I worked on in most of the classes. That's why I'm so happy with Sockupied. It's the best of both worlds—a digital magazine with videos, diagrams, in-depth technique studies, and beautiful patterns! There are a lot of aspects of knitting these socks that make them a really fun, interesting project. Here's a fun color plan for an argyle sock; my friend Annie picked this color scheme to honor her alma mater University of MIchigan. This is what the McGonagall sock looks like when the knitting is complete, pre-seaming. Doesn't this look fun? First off is choosing the colors. There are myriad color combos you can choose, of course, but Sockupied makes it easy to try before you buy with a color selecting program that lets you see how your color choices will look before you commit (see photo at right for a sample). Secondly, the socks are knit both in the round and flat, with seaming done strategically at the end (see photo at right). And Anne is right there with you—via video tutorials—to guide you through the knitting and seaming process. Thirdly, the diagonal lines (yellow in the photo) are done using duplicate stitch, which I think is really fun (it must be my history with cross-stitch!). After spending time with the McGonagall Socks, I can honestly say that I haven't been this motivated and excited about knitting a pair of socks in a long time! 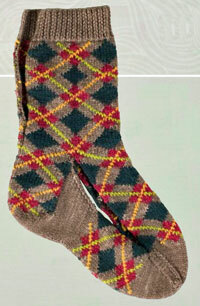 Get your issue of the new Sockupied and start your sock knitting class today!